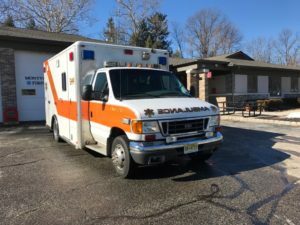 The Montville Township First Aid Squad is an organization that has been providing emergency medical services to the people who live and work in Montville Township since 1964. During the past three years the Squad’s volunteers have responded to almost 3,900 calls, which required contributing in excess of 93,000 hours of volunteer services. This response includes supporting the township’s fire departments by providing emergency service when the home residents or business occupants require medical assistance, as well as to the firefighters if necessary. In addition to helping Montville Township residents, the Squad has also stepped in to support Boonton and Lincoln Park when their squads were fully deployed and they required additional assistance. Frequently New Jersey State Police will also request emergency medical response from the Squad when needed on the county highways that operate through the township. We provide 24/7 coverage completely free of charge, and therefore, we depend on your generosity and donations to support our operations. Please click here to donate to our organization. In addition, we are always looking for new members, so give us a call or stop by the squad house to see what we’re all about! Or, you can click here if you are interested in filling out an application now. We have a centrally located 5,500 square foot building with 3 bays to house our ambulances. The remainder of the building has a Crew Lounge, a large Training Room, sleeping quarters for use by the duty crew during inclement weather, a small kitchen, and other rooms to store supplies and equipment. Our ambulances meet the New Jersey State First Aid Councifacilityl requirements and are inspected and certified each year. Each of the ambulances are equipped with an Automated External Defibrillator (AED) for treating Cardiac Arrhythmia, as well as automatic chains that can be deployed while they are moving over snow/ice covered roads, allowing crews to respond to calls during bad snow or ice storms. Our organization meets once a month to review procedures and discuss any pertinent information that involves the squad. The monthly meetings are held on the second Tuesday of each month from 7pm to 8pm for Executive Board members, and from 8pm to approximately 9pm for the General Membership. All members are encouraged to attend.